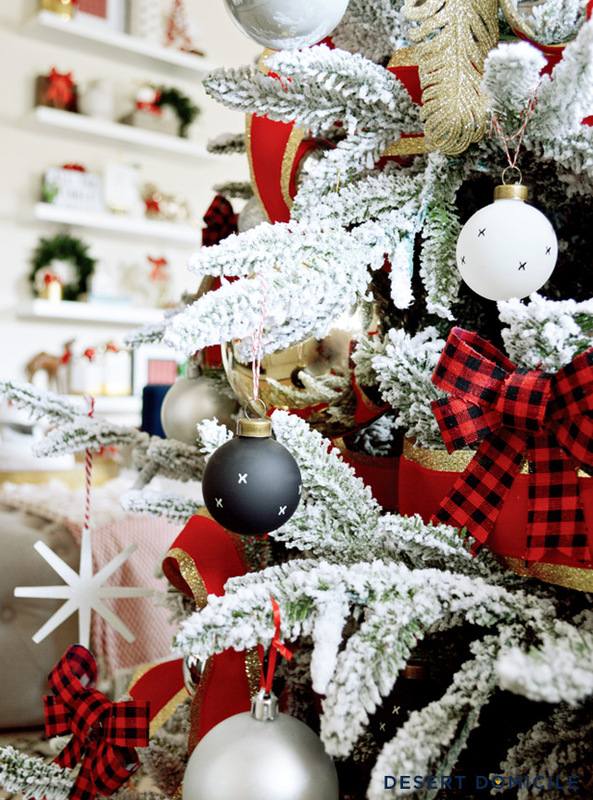 I've been a busy little elf for the past two weeks and I'm so happy that all of my hard work will be gracing your screens today as I share part 1 of my 2017 holiday home tour! I'm sure you've noticed that things have been a bit quiet around here. All I can really say is my priorities have changed. That being said, when I was invited to participate in two holiday home tours, I said yes to both because I miss you guys! The first tour is happening today! 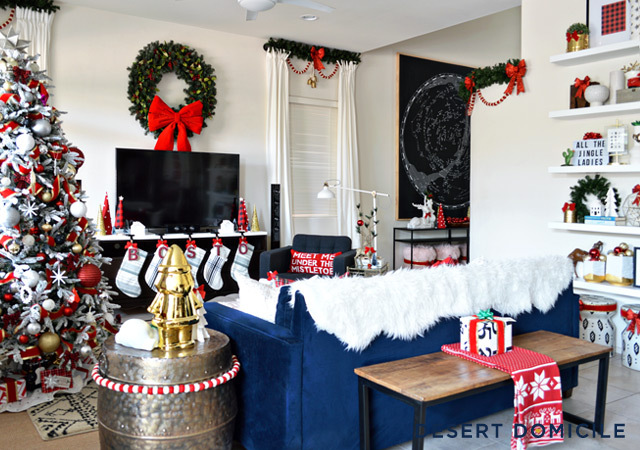 It's the Winter Eclectic Holiday Home Tour and it's hosted by Jess at Domicile 37. If you're stopping by from her tour – hello and welcome to our home! 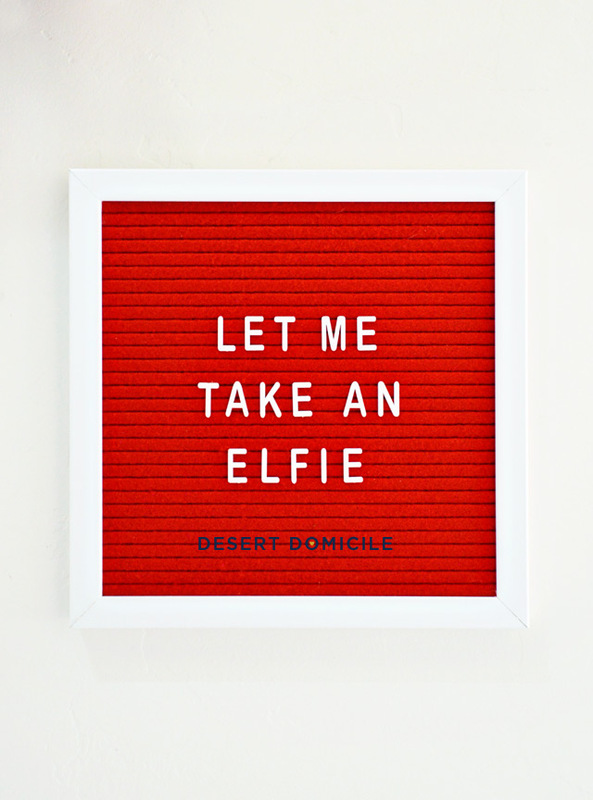 I'm Caitlin and I live in the desert with my husband and our 3 fur babies. I've split my home tour into two parts and today I'll be sharing our foyer and living room with you. We have an open concept home with a two-story foyer. If you're familiar with this space, you'll notice a lot has changed! 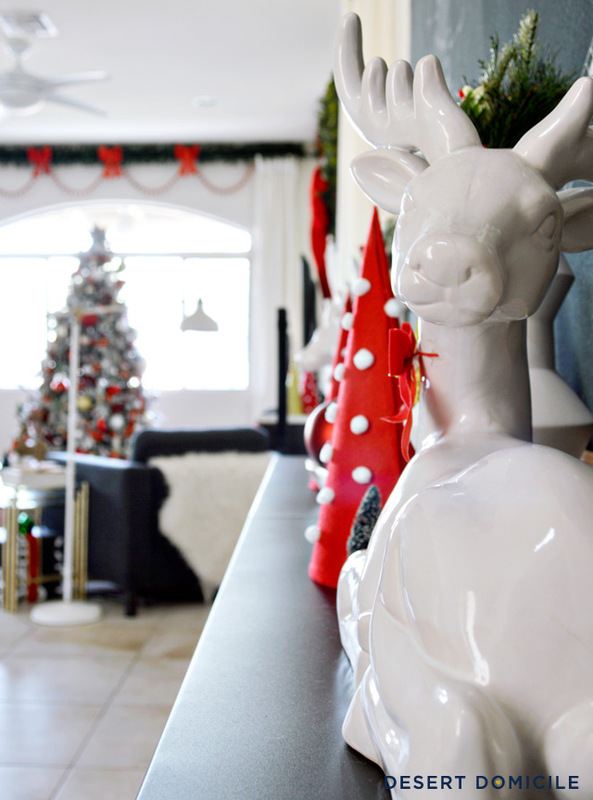 We've added two metal console tables that we've decorated with ceramic deers and a mini tree forest. I wrapped the four pink ottomans with some red and gold ribbon to help them coordinate with our black, white, red, green, and gold color scheme! The sliver of green garland you see in the photo above wraps all the way around and down our staircase. 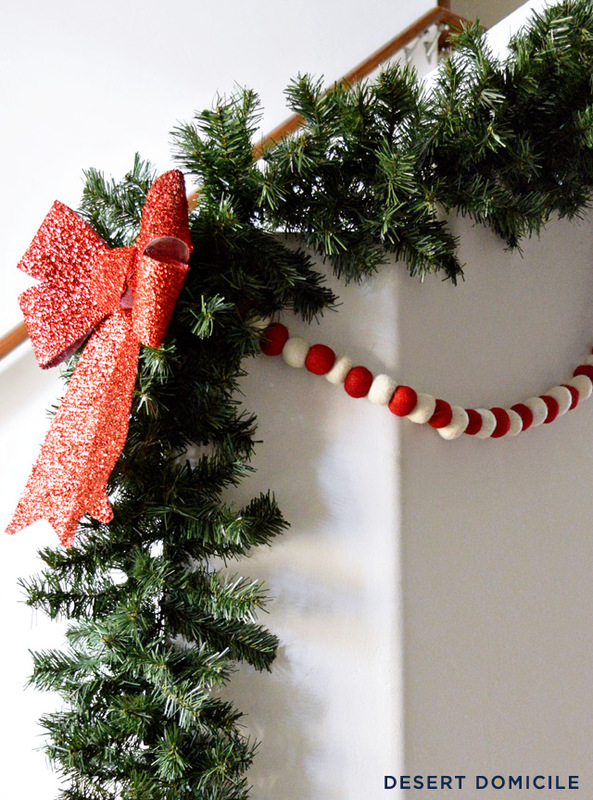 I paired the green garland with some red and white pom pom garland that I found at Michael's for $10/strand. I ran all over trying to find enough strands to add to our windows and staircase and I got just enough before they sold out everywhere. Phew! 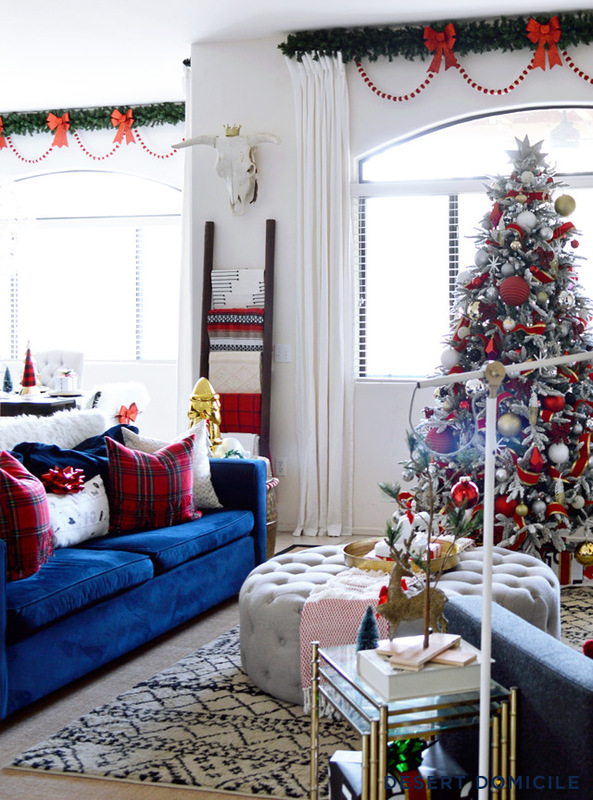 It's a good thing you stopped by today because our living room won't look like this much longer! Not because our Christmas decorations will be put away soon but because we're planning to makeover our living room in the spring. We bought a new Christmas tree this year. It's flocked and I'm obsessed with it! It has 8 different LED light settings (warm white, colorful, twinkling, etc.) but we usually leave it on the warm white option since it makes the tree look like it's glowing! We're not sentimental ornament people so all of the ornaments on our tree are random finds from Dollar Tree, the 99 Cents Only Store, and Target. The ribbon is from Michael's and I'm in love with the crazy way I draped it this year! Speaking of Michael's: I got this cute little lumbar pillow there for $13.50! It was originally $45 and I almost bought it with a 50% off coupon but I decided I didn't really need it. I'm so glad I passed on it that time because they were having a 70% off Christmas sale last week and this pillow was included! I love the handmade look! 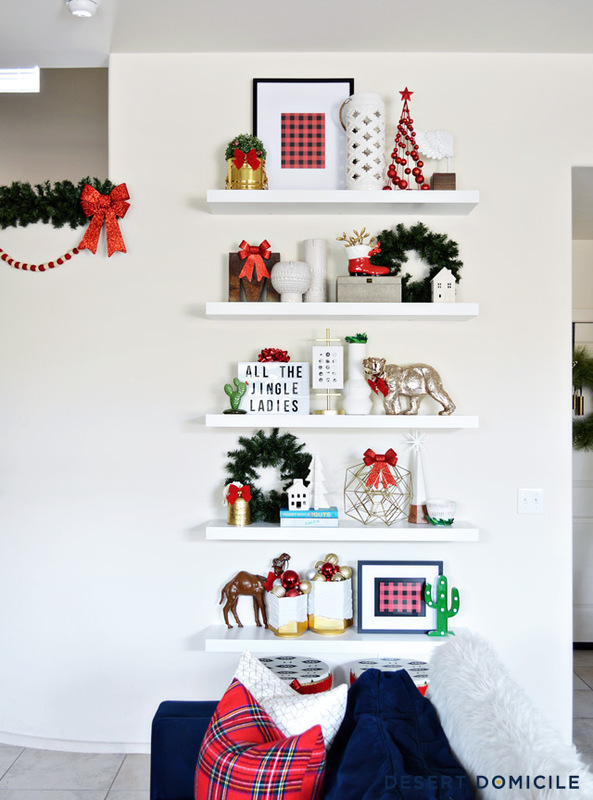 If you follow me on Instagram, you've already seen these shelves pre-Christmasfied. 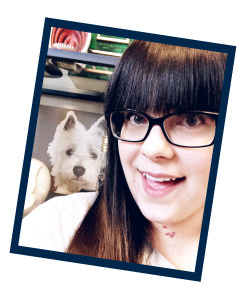 Little note: if you don't follow me on Instagram, you're missing out! I post much more often over there than I do here or on Facebook. Anyway, I kept the majority of the same items on the shelves but I did add a couple of wreaths, some bows, and ornaments. I also swapped out the artwork for some framed wrapping paper to make the shelves more festive. Let's turn on the tree! 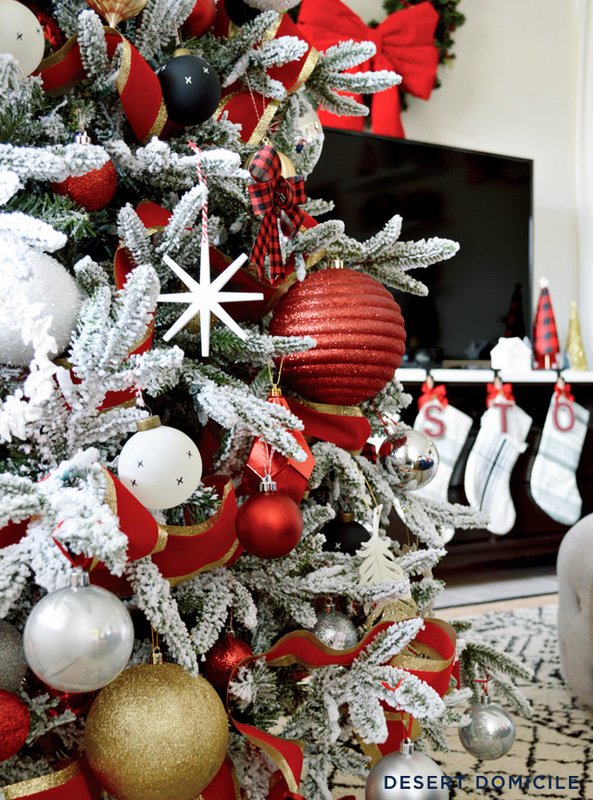 I love the warm glow of the lights at night and how all of the glitter ornaments shimmer! Don't forget to stop by the next stop on our tour! The talented group below will be sharing their homes with you all week long continuing next with Whimiscal Blue Living. 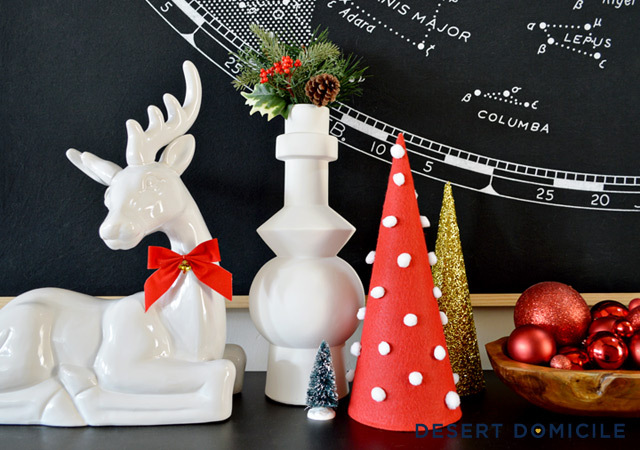 See you for part 2 of our home tour next Monday, December 11th! Dang girl! You outdid yourself...I need to step my game up! This looks amazing! I love the greenery on the curtain rods and how fresh and crisp everything looks. Absolutely stunning! 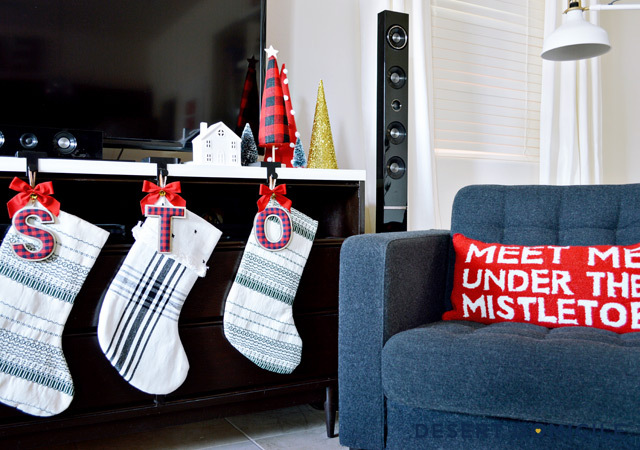 OMG-you definitely made up for not decorating last year! You mixed the colors and patterns perfectly! 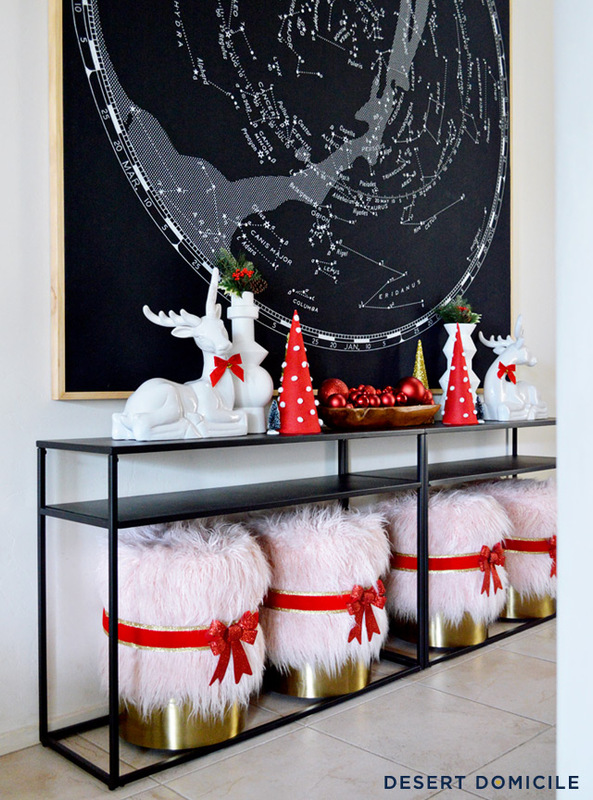 The details of the pom pom trim, the letter board...I mean, I just love it all! Thank you so much Saher! :) It's been a labor of love to get it all done but we're so happy with the results! I can't wait to see your tour on Friday! Missed these updates! It looks great and that tree is gorgeous! Loooooove allllll the things Caitlin!!! It looks so so fun and festive. 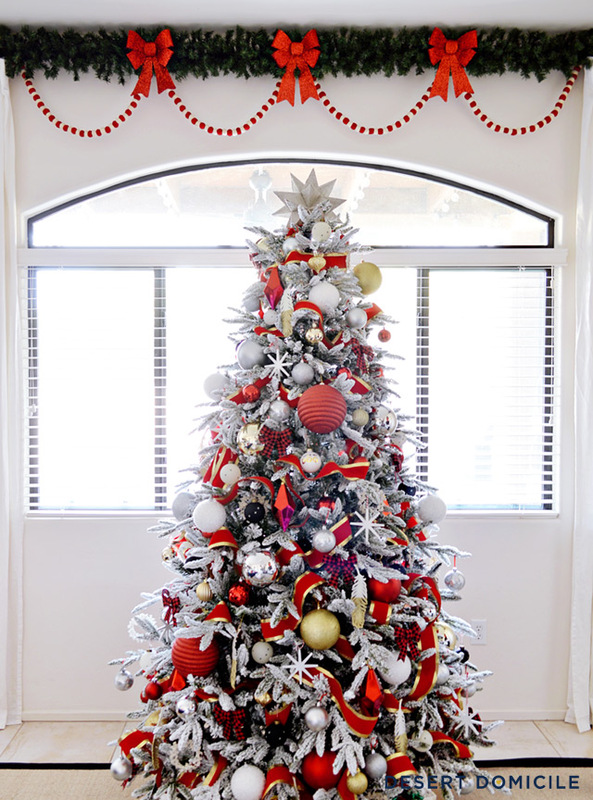 Love the colors and the sparkle and the flocked tree!!!!! Soooo pretty and bright! And those pops of red are perfect! Such a fun and festive tour. 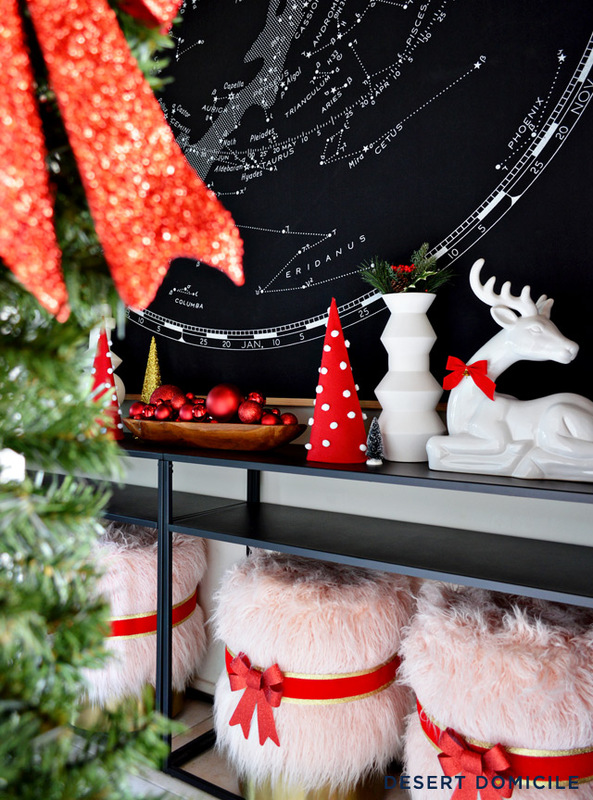 Love the flocked tree! Oh my goodness! Everything is perfection in here, Caitlin! 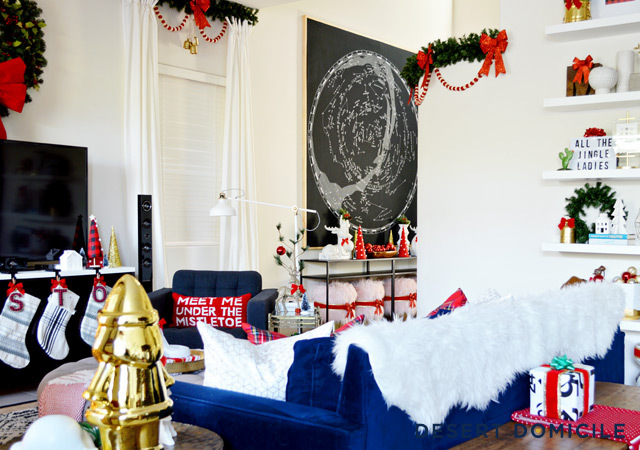 I'm dying over your pompom garland over the windows -- that's absolutely brilliant! You did an absolutely beautiful job here, my friend! Also, I just wanted to say that I 100% understand what you're saying about priorities changing -- I've been right there with you lately. 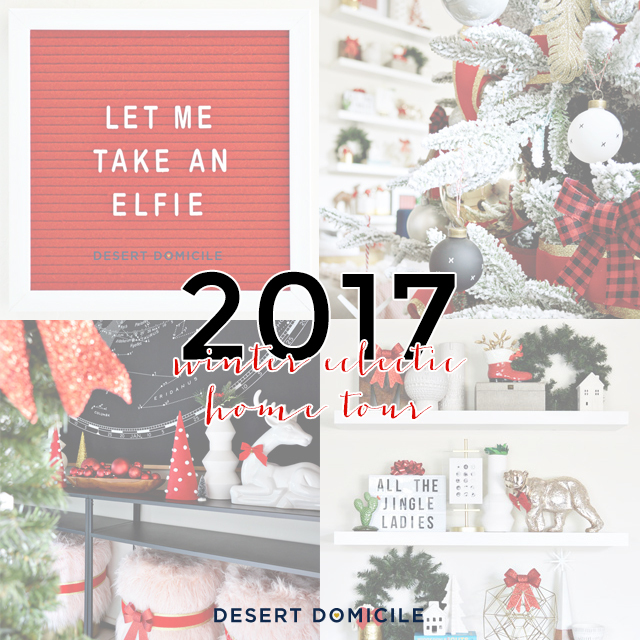 I'll always love decorating and sharing my home, but blogging has definitely taken a back seat lately after the new job this year. I love this! 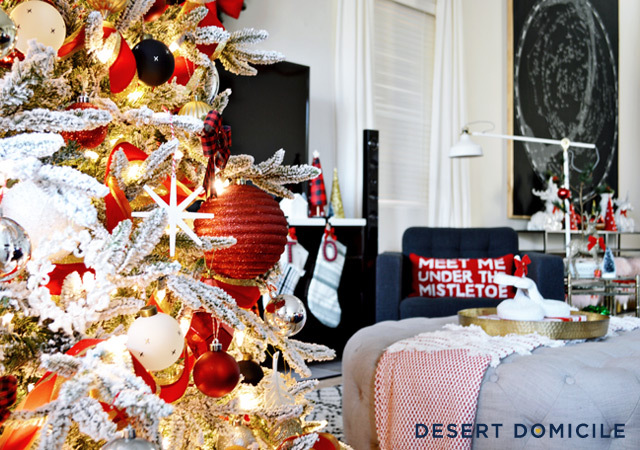 That tree is amazing and is framed perfectly with your b&w window treatments. I LOVE your blue couch but I'm excited to see what changes will come in the Spring. Sounds like you are doing some serious nesting. ;) Have a wonderful Christmas! 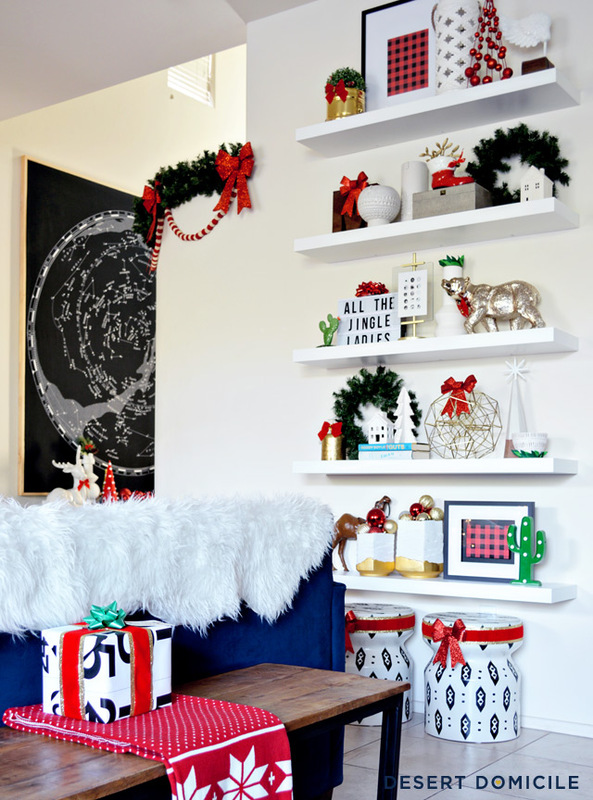 It's hard to believe that you didn't decorate last year!! You're amazing at it!! I'm beyond impressed! 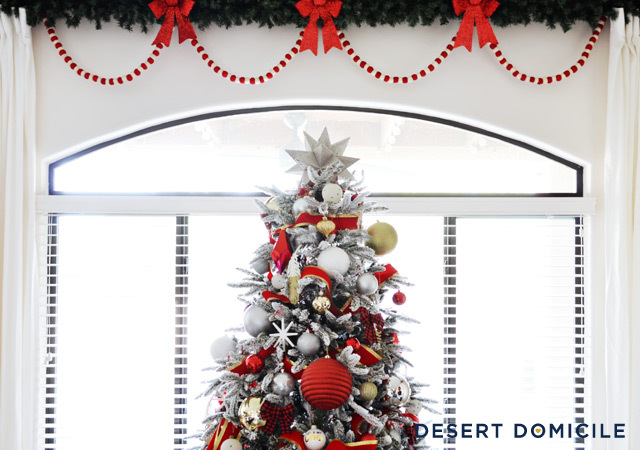 This is so cheery and bright... Hope your Christmas is wonderful this year! Gooooodness it's like Christmas on crack!I love how bright and happy it all is. The garland on the curtains is my fave.